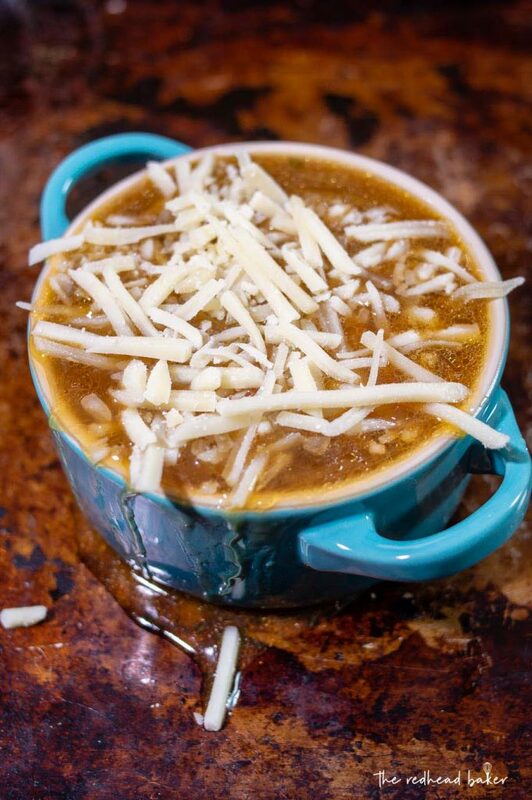 Is there anything better on a chilly winter day than a bowl of hearty French Onion Soup topped with melty cheese? I have a love/hate relationship with winter. I hate being cold. I hate walking the dogs on icy sidewalks. I hate driving in the snow. I hate how little daylight there is in winter. But at the same time, I’d hate to live in a place that didn’t have winter. I love being home on a snow day, watching the flakes fall with a cup of hot cocoa, and a pot of soup simmering on the stove. When my brother and I would come inside from playing in the snow, my parents would make us each a grilled cheese sandwich and a bowl of soup: chicken noodle for me; creamy tomato for my brother. I’m picky when it comes to soup. I usually prefer creamy soup, unless it’s tomato soup. Chicken noodle is one exception; French onion soup is the other. Maybe it’s the layer of gooey, melty cheese on top. Good French onion soup is based on well-caramelized onions. Caramelizing onions (breaking down the sugars in the onions to produce a sweeter flavor) takes time; you can’t rush the process. Some try to cheat by adding sugar to the onions as they cook, but I don’t like the flavor that gives to the soup overall. This recipe can be made ahead of time, through Step 7, then cooled to room temperature and refrigerated for up to 3 days. Reheat the soup to about simmering before proceeding with Step 8. Yum!! One of my all-time favorites! This looks delicious and I’d love a bowl on the cold day. This is my guy’s favorite soup. I never make it at home. That’s going to change now! Great cheese pull shot! This soup sounds soooooo good. If I could pick just one soup, it would be French onion. I love ordering French Onion Soup at restaurants but have never tried making it at home. I think that will have to change now! Thanks for sharing on the Celebrate 365 Soup Swap! This soup looks so delicious and comforting!! I love that it’s so easy to make at home, too. That cheese shot!!!! I love how easy this is to make and I definitely need to make it soon. 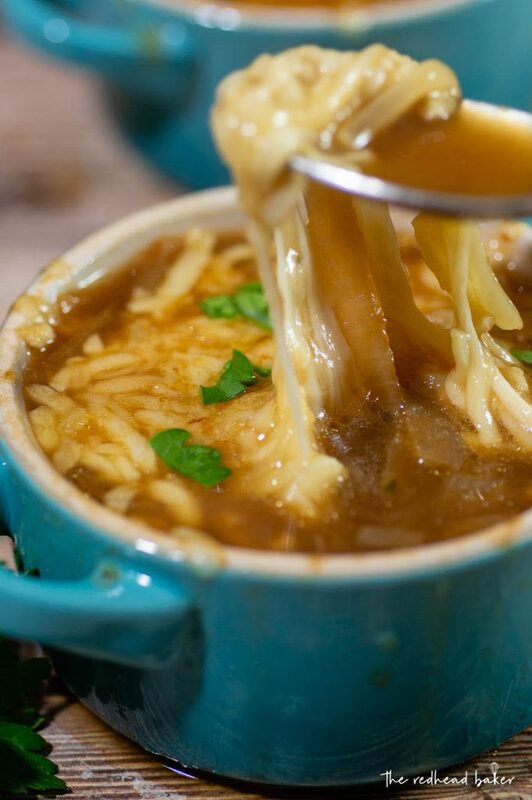 Who can resist and ooey gooey bowl of french onion soup? This looks so divine and comforting! This is my favorite soup! I wish I had a bowl now. Thanks for celebrating National Soup Swap Day with us! This is probably one of my favorite soups…it’s just perfect!!! 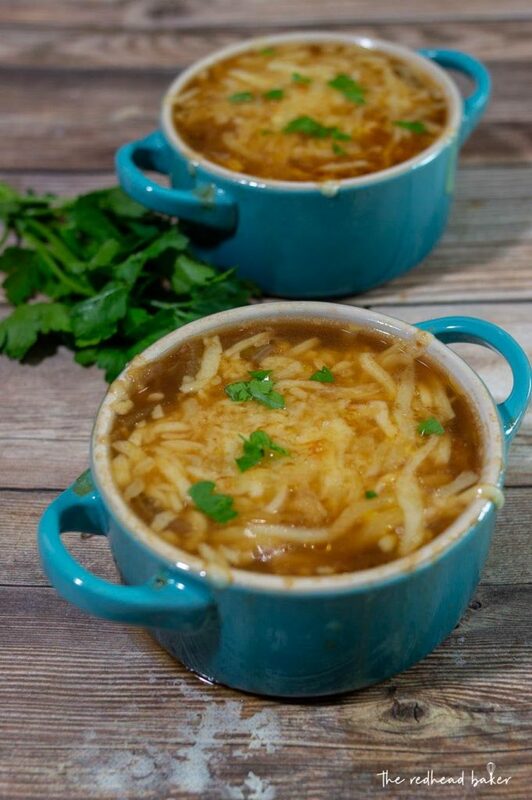 A rich and flavorful french onion soup is the stuff of dreams! And I love that beautiful cheesy topping! I want to reach in and eat it! This is a classic that I will never get tired of! I absolutely love French onion soup. All that cheesy goodnesss! I am with you on winter, love the food but not the cold. Oh my, this French Onion Soup is fantastic. I am a huge fan of French Onion Soup and your recipe is great. I love that you used Juniper Berries, they add a great level of flavor. This is my husband’s favorite soup and it’s slowly disappearing from menus around here. Will be so nice to surprise him with it at home! 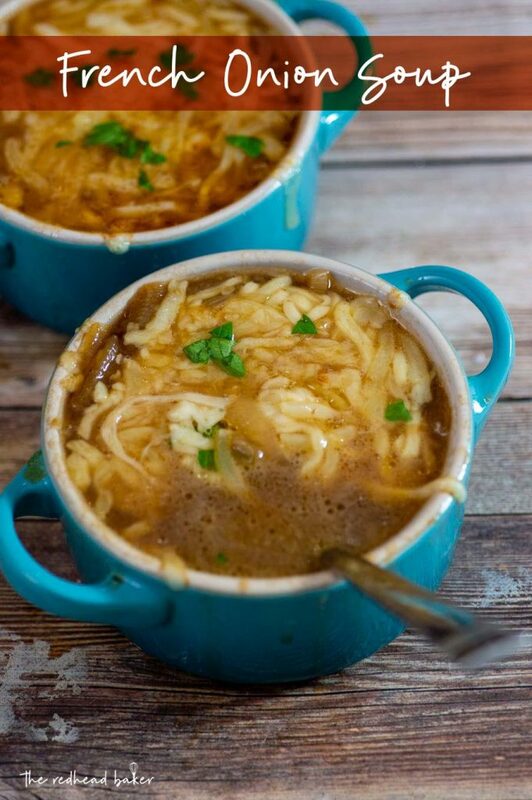 I love french onion soup and this version looks incredible! I can’t wait to try!